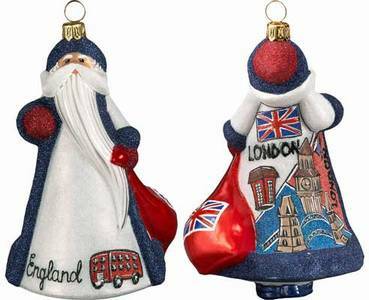 We have a selection of fine Christmas ornaments with a British theme. All of the ornaments on this page are fine European blown glass in origin as the finest blown glass ornaments are still made there. We also have some that were made in China as indicated in the description. 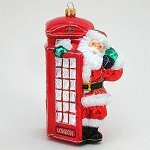 You will find other pages of fine Christmas ornaments listed on the menu to the left. 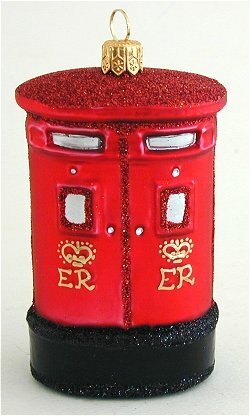 A recognizable icon of the UK the red post box is going the way of the red phone booth. The London Eye is the vision of David Marks and Julia Barfield, a husband and wife architect team. 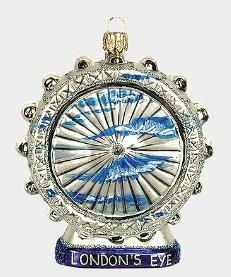 The wheel design was used as a metaphor for the end of the 20th century, and time turning into the new millennium. The London Eye is the UK s most popular paid for visitor attraction, visited by over 3.5 million people a year. 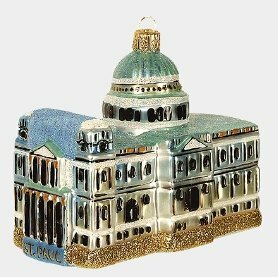 Icons of England wrap all the way around this beautiful ornament. 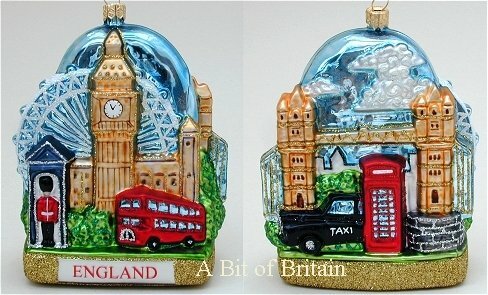 From Big Ben to the London Eye your memories will come flooding back. Sherlock Holmes is giving Dr. Watson a ring from this classic phone booth. At one time found throughout Great Britain now the majority have been replaced with modern ones except in tourist areas of London. 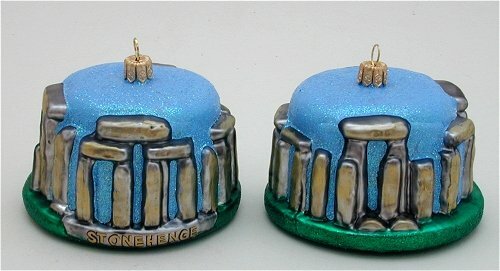 4.25 inches high and packed in a beautiful gift box. Big Ben the 320 foot high Clock Tower is named after the largest bell, weighing over 13 tons, and was cast in 1858 at the Whitechapel Bell Foundry in East London. 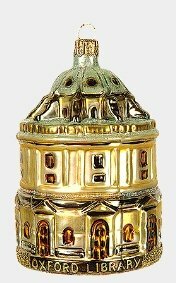 Fine european glass from Poland. The current Cathedral the fourth to occupy this site was designed by the court architect Sir Christopher Wren and built between 1675 and 1710 after its predecessor was destroyed in the Great Fire of London. 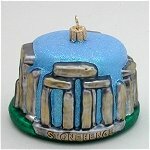 St Augustine, the first Archbishop of Canterbury, arrived on the coast of Kent as a missionary to England in 597 AD. 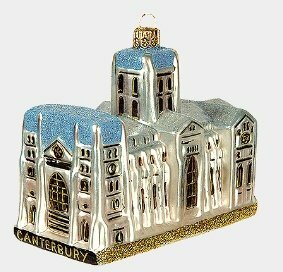 He came from Rome, sent by Pope Gregory the Great..
Augustine was given a church at Canterbury (St Martin's, after St Martin of Tours, still standing today) by the local King, Ethelbert whose Queen, Bertha, a French Princess,, was already a Christian. This building had been a place of worship during the Roman occupation of Britain and is the oldest church in England still in use. Buckingham Palace has served as the official London residence of Britain's sovereigns since 1837 evolving from a town house that was owned from the beginning of the eighteenth century by the Dukes of Buckingham. Today it is The Queen's official residence, with 775 rooms. The circular dome and drum of the Radcliffe Camera is one of the most distinctive landmarks in a city full of distinctive buildings. The camera (the word means simply 'room') was built 1737-1749 with £40,000 bequeathed by Dr John Radcliffe, the royal physician. 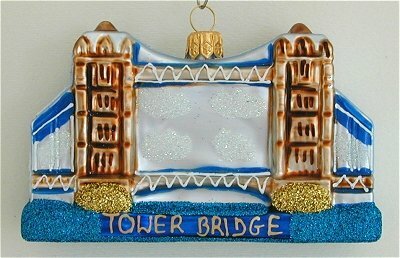 One of London's most endearing and famous landmarks is the clock tower we commonly refer to as 'Big Ben.' 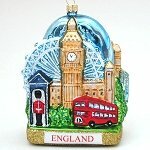 The tower, with its richly ornamented pinnacles, parapets and spires, is actually part of England's Houses of Parliament; however, Big Ben is actually not the clock tower itself, but the main bell inside the clock! 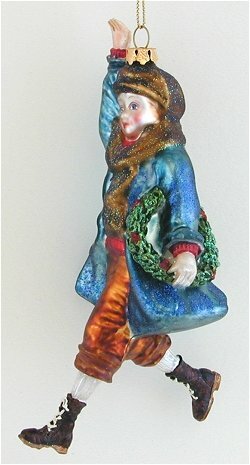 4.75 inches high in a beautiful gift box. 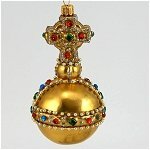 The Sovereign's Orb is one of the British Crown Jewels. 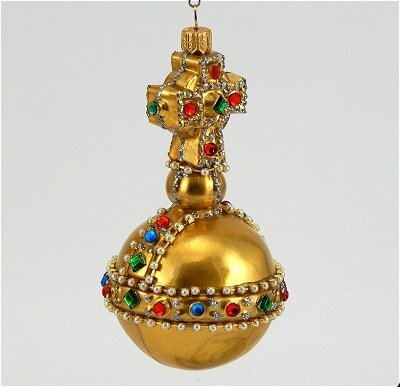 It was created for the coronation of King Charles II in 1661 along with the Sceptre with the Cross and Ampulla. 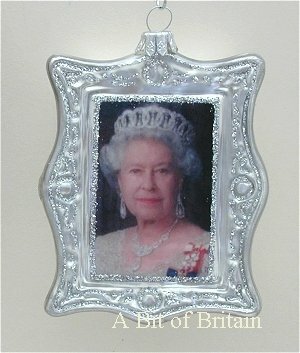 Its value today is around 138 thousand English pounds. 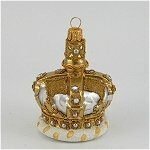 A crown fit for a King or Queen as the case may be. 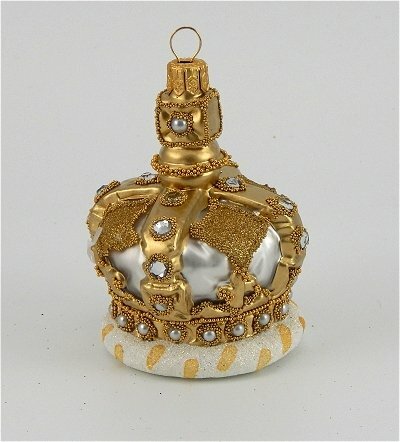 This crown is reminiscent of The Imperial Crown of India made for King George V.
Queen Elizabeth II Diamond Jubilee Portrait Polish Glass Christmas Ornament Approximately 4 inches tall (10cm). 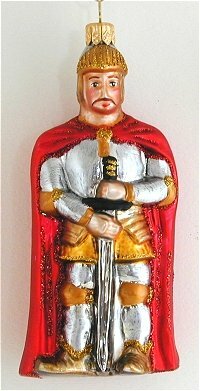 The responsibility of guarding the Sovereign by the Household Troops (as they were known at the time) dates back to the time of Henry VII (1485-1509). The men you will see in front of Buckingham Palace (and other locations) are not just ceremonial guards but also serving Soldiers. While upholding the traditions of the past, they also perform duties throughout the world as professional soldiers and are known as some of the most elite and skilled soldiers in the British Army. When I think of Buckingham Palace I think of the changing of the guard, a daily occurrence watched by thousands of tourists. 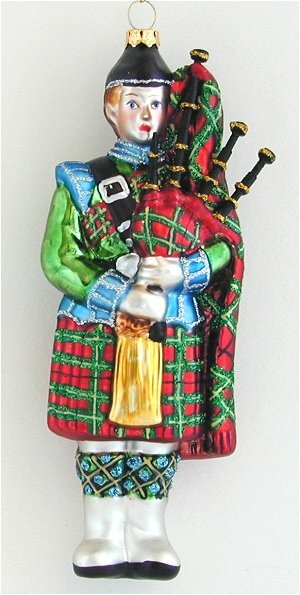 Have our guard from the Scots regiment for your tree. 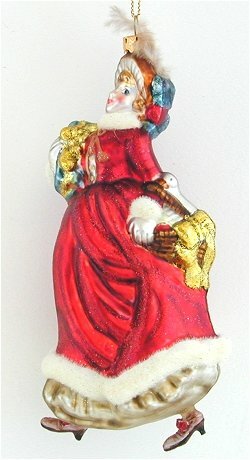 Ornaments is 4 inches high and comes beautifully gift boxed. One of the most popular Tower attractions involves people: the Yeoman Warders or Beefeaters to be exact. They were originally established in 1485 as King Henry VIII's bodyguard and are perhaps best known for their gorgeous scarlet and gold dress uniforms which date to 1552 and are worn on state occasions. 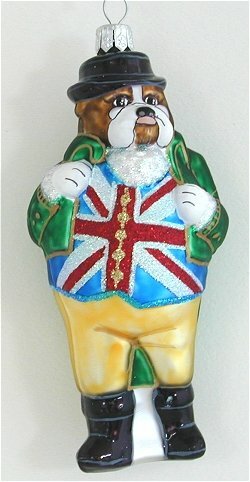 The Union Jack waistcoat makes him recognizable as the John Bull figure of the 18 th century England. He stands @ 5 inches tall. One of the eleven pipers piping for you. 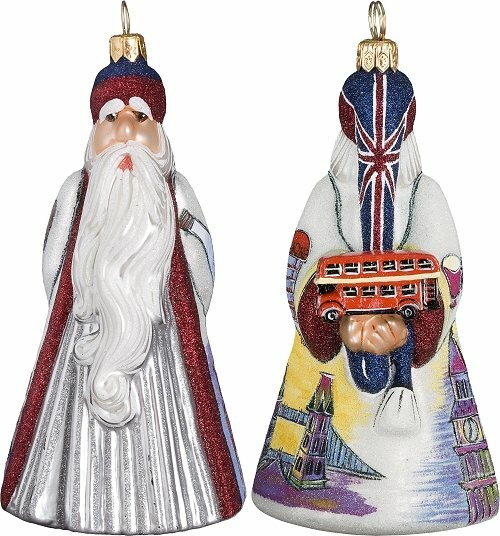 A beautiful glitter covered Santa depicting scenes of London on his front and back. 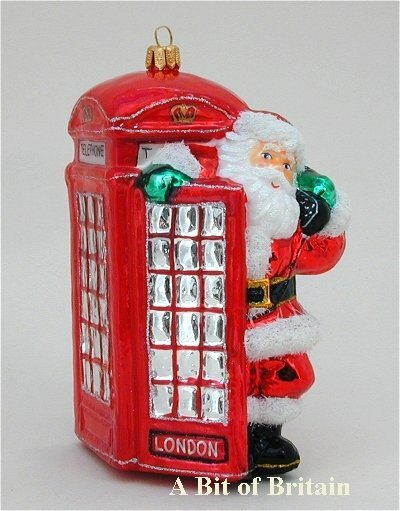 What is Santa hiding behind his back ? View larger photo to see. 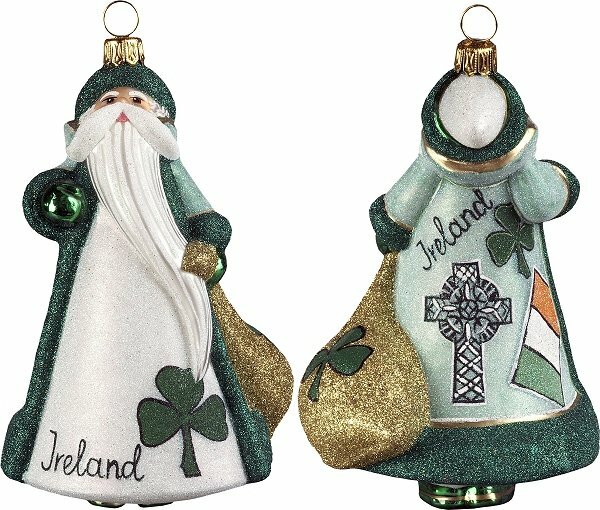 Enliven your tree with this Irish Santa. 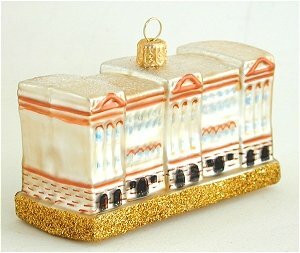 When you look at the large photo you will see what I meant about the quality painting and glasswork on these ornaments. 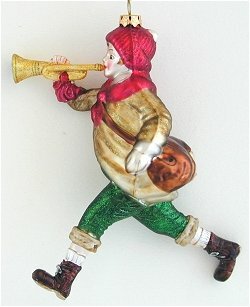 They have mixed their medias with resin on the pipes for fine details and the figure from blown glass. 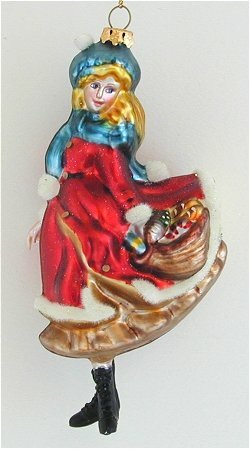 Mixed media blown glass ornament, Victorian girl with a basket.